Although the boneﬁsh was previously thought to be the only member of the Albulidae family, there are now ﬁve recognized species. The boneﬁsh is the only signiﬁcant sportﬁsh among them, however, and is one of the most coveted of all saltwater gameﬁsh. In keeping with its scientific name, which means “white fox,” it is indeed a wary, elusive creature, one that usually must be stalked with stealth and that bolts with startling speed when hooked or alarmed. Although boneﬁsh have little food value to anglers and virtually all are released, they are a subsistence food in some locations. It is generally believed that bonefish are not good table fare, but some gourmands maintain that bonefish flesh is firm and tasty and the roe a delicacy. The boneﬁsh has armor plates, instead of scales, on its conical head and is distinguished from the similar ladyfish by its suckerlike mouth and snout-shaped nose, which are adapted to its feeding habits. It also has a single dorsal fin and a deeply forked tail. The coloring is bright silver on the sides and the belly, with bronze or greenish-blue tints on the back; there may also be yellow or dark coloring on parts of the ﬁn and the snout, and sometimes there are dusky markings on the sides. The young have bronze backs and nine narrow crossbands. Although the average boneﬁsh weighs between 2 and 5 pounds, boneﬁsh weighing up to 10 pounds are not uncommon. They can grow to 41 inches in length, averaging 1 to 2.5 feet long. The all-tackle world-record catch is a 19-pound ﬁsh. The particulars of boneﬁsh reproduction are not well known, although it is thought that boneﬁsh spawn from late winter to late spring, depending on locale. With a small head and a long, transparent body, the young boneﬁsh looks like an eel until it undergoes a leptocephalus larval stage. It grows to about 2.5 inches long during this period, then experiences a metamorphosis that shrinks the young boneﬁsh to half that size. The ﬁns begin to appear during the shrinking, and in 10 to 12 days it attains the adult boneﬁsh body form, only in miniature size. This growth process is similar in tarpon and ladyﬁsh development. The young migrate out to the open sea to live on plankton, returning as juveniles to live in the shallows. Generally, boneﬁsh are a schooling ﬁsh; smaller specimens are seen traveling in large numbers on the flats, whereas larger ones prefer smaller schools or groups of 5 to 10 ﬁsh. Boneﬁsh feed on crabs, shrimp, clams, shellﬁsh, sea worms, sea urchins, and small ﬁsh. They prefer feeding during a rising tide, often doing so near mangroves. They root in the sand with their snouts for food and are often ﬁrst detected while feeding with their bodies tilted in a head-down, tail-up manner, with all or part of their tail ﬁns protruding from the surface. These are referred to as tailing fish. Bonefish also sometimes stir up the bottom when rooting along, which is called mudding; this can be a telltale indicator to the observant angler. banana ﬁsh, phantom, silver ghost, ladyﬁsh, grubber, silver streak, tenny; French: banane de mer, sorte de mulet; Hawaiian: o’io; Japanese: soto-iwashi; Portuguese: juruma; Spanish: macabí, zorro. Boneﬁsh are found worldwide in tropical and subtropical waters. Around North America, they are most bountiful in the Florida Keys, the Bahamas, and the Caribbean, more so in the winter than in the summer; they are also somewhat abundant in Belize, Panama, and other Central American countries. Occurring in warm coastal areas, boneﬁsh inhabit the shallows of intertidal waters, including around mud and sand ﬂats, as well as in mangrove lagoons. They are also found in waters up to 30 feet deep and are able to live in oxygen-poor water because they possess lunglike bladders into which they can inhale air. 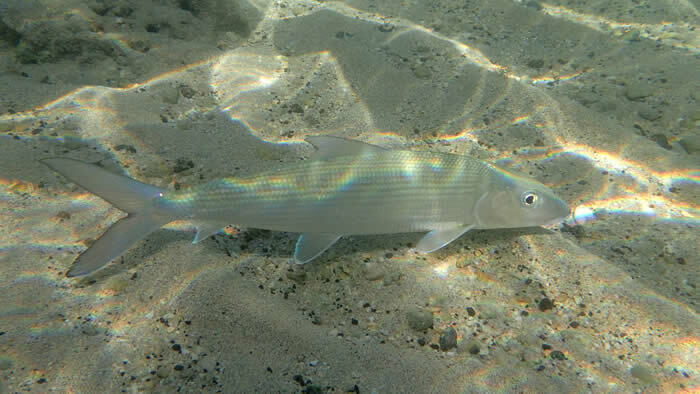 0 Response to "Bonefish (Albula vulpes)"